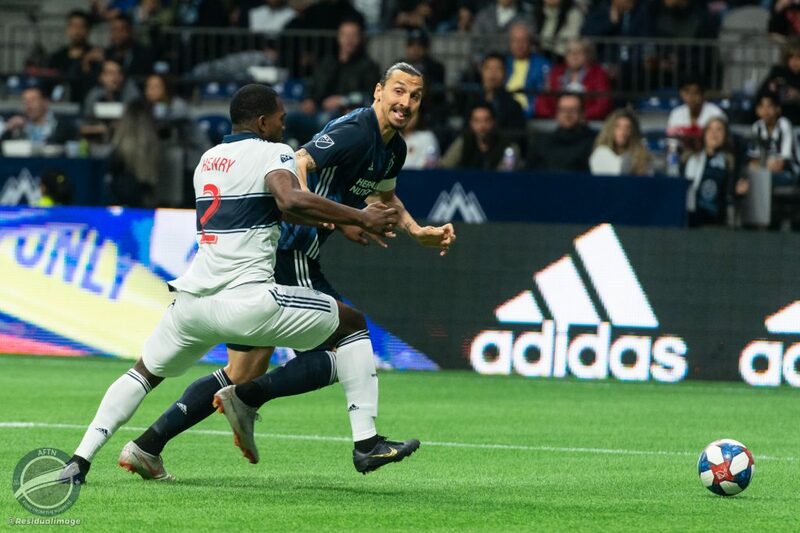 They may have had their chances, but Vancouver Whitecaps were unable to get any goals in the first half allowing Zlatan and the Galaxy to take over and complete a 2-0 victory in front of a sell out crowd at BC Place on Friday night. 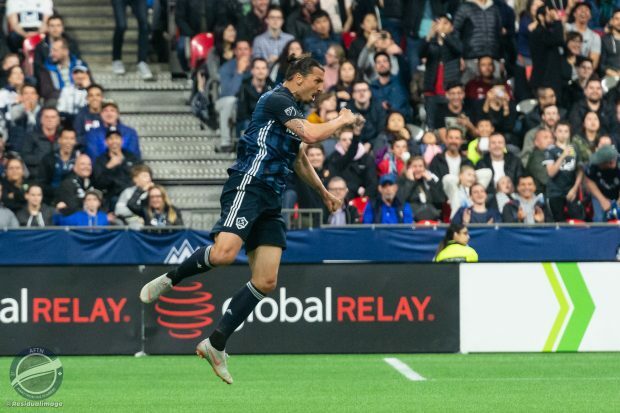 After setting up Daniel Steres for the winner, Ibrahimovic scored one of his own, sending his fans to their feet and sinking Whitecaps hopes and hearts. It was close to a perfect start for the ‘Caps when they were given a penalty in the first minute after Lass Bangoura was taken down in the box. The result, however, was disastrous, with Ali Adnan’s Panenka scuffed and easily smothered by David Bingham, with the ball not even reaching the goalline. The Whitecaps were looking the better side and Joaquin Ardaiz, getting his first start at the expense of Fredy Montero, found himself in the clear in the 19th minute, after a couple of Galaxy defenders bundled the ball in the box, but Bingham was able to come up big and deny the striker. An end to end rush by Vancouver, ten minutes later, saw Hwang turn his opponent inside out but a weak shot was gathered up by Bingham, who was looking strong in the LA goal. The Galaxy had their chances in the first half, with an Alessandrini volley sailing over the bar being the closest they came to opening the scoring. After the break Ibrahimovic was twice close to breaking the deadlock in the opening minutes. First he shot wide on an open net and then was called offside after firing home from 12 yards out. This was just delaying the inevitable, and the Swedish international would be involved in the opening LA goal, just after the hour mark, sending a cross to the far post where Daniel Steres was all alone to put the Galaxy on top, heading home with ease. It was horrible defending from Vancouver and it wasn’t the last we would see over the course of the evening. Ibrahimovic finally found himself on the scoresheet eight minutes later when he was able to gather a cross in the box, chest it down, before swivelling and firing it past Max Crepeau to put the visitors up by two. 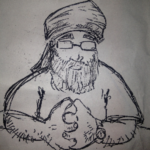 Adnan’s attempt from distance in the last ten minutes was the closest the ‘Caps came to getting on the scoreboard but in the end a fourth loss in five matches to start the season would be the end result. Despite their chances the ‘Caps have gone a second straight scoreless match at home and have gone 216 minutes now since their last goal. Once again the ‘Caps showed flashes but it seems like the closer they get to goal the more they forget how to connect passes or finish with their shots. The ‘Caps have also now only garnered a single point in their first five matches under dos Santos, including three at home. It’s made some of the natives restless and it doesn’t get easier for them over the next few weeks as fixture congestion and travel become issues when they travel to Chicago to take on the Fire next Friday.